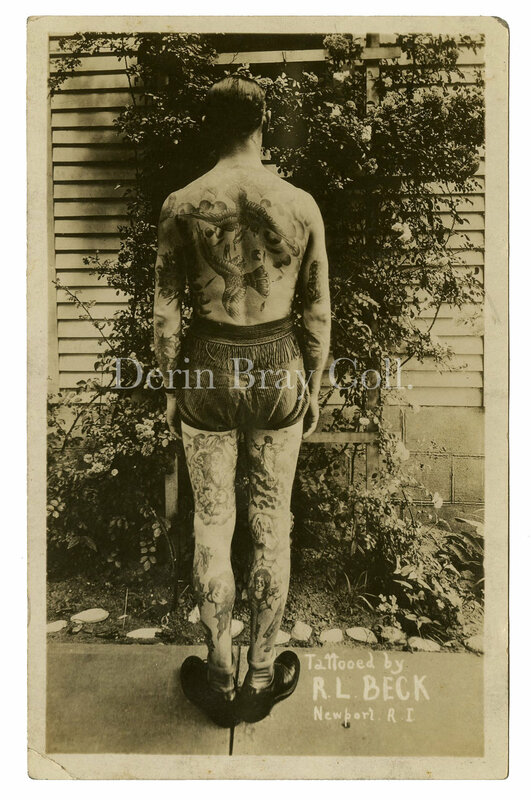 Ward Clark Hallings (1895-1990) got his first tattoo in Detroit around 1916. Within a few years he received a full suit of classic designs from veteran tattooer Richard L. Beck. Although Beck operated a shop in Newport, Rhode Island, he probably completed the work at his main studio and residence in Rochester, New York, where Hallings and his family called home. Hallings trouped with some of the eras largest carnivals and sideshows, but spent most of his career tattooing in Seattle, WA, Charleston, SC, and Watertown, NY. For more information on his life and career, check out my article in the third issue of the Bristol Tattoo Club Newsletter.